« ¡Hola! Spring. (Part II). 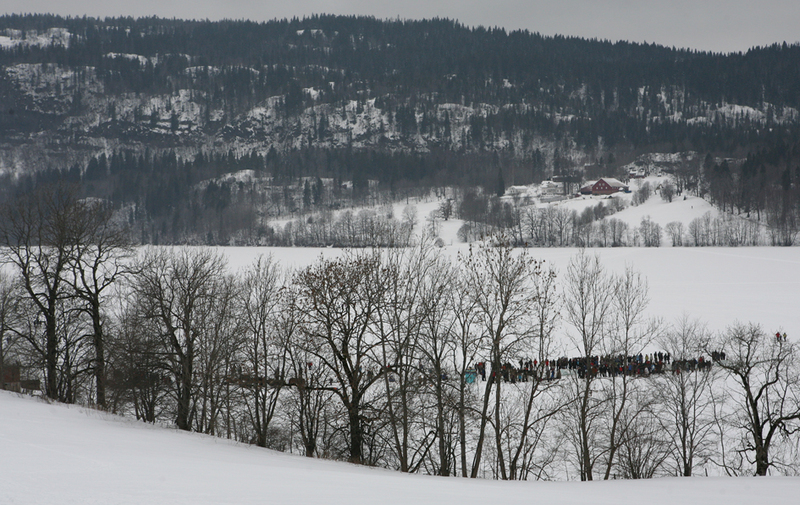 I saw some people coming from the lake this afternoon, and then I remembered it was ice-cutting day. So we went down there. There was quite a crowd. Every so often there was a huge cheer and some applause. The fact is I don’t really know what was going on. By the time Topsy & I arrived, all the action was over. I’m not sure what the horses & sleighs were doing. These men may look like total wallys, but you can tell they’ve been looking forward to this for months. When I asked about the horse, the one on the left was quite nice. 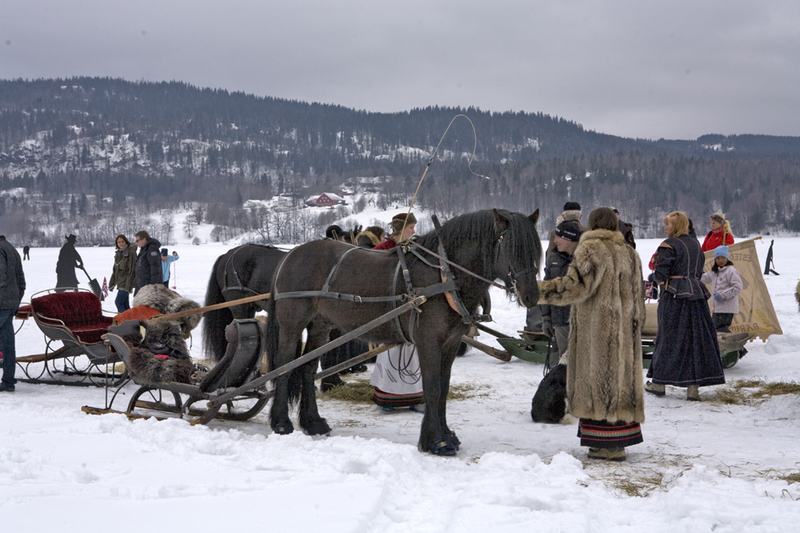 These are cold-blooded Gudbrandsdal horses, and they’re used to hauling loads. I don’t think anyone rides them. I like the brass bells on the horse’s back, the sound reminds me of Father Christmas. The main event today was the cutting of these blocks of ice. It’s some sort of old tradition, I think I remember hearing that they used to send some from our lake to Queen Victoria before she got her own refrigerator. The blocks are about the same size as she was, about two-feet square (60cm). 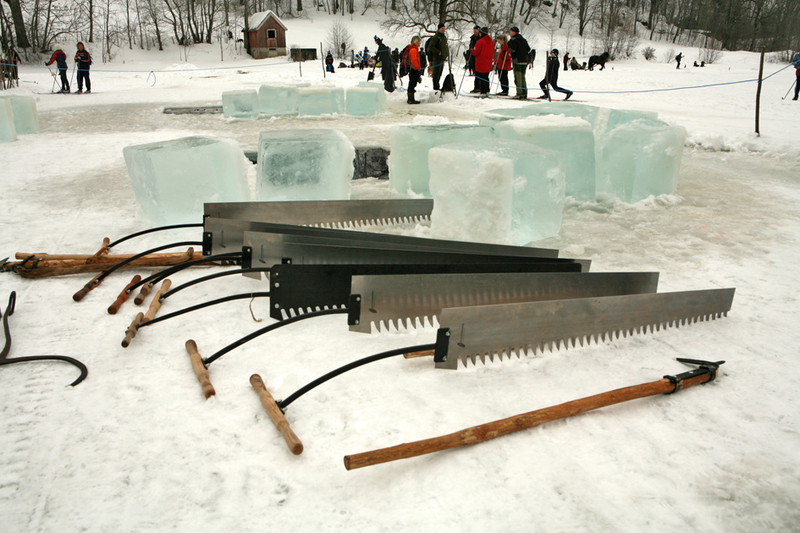 In the foreground are the saws they used. They’ve sawn out the blocks in four or five neat rectangles, and they’ve roped-off the area so no one falls in. 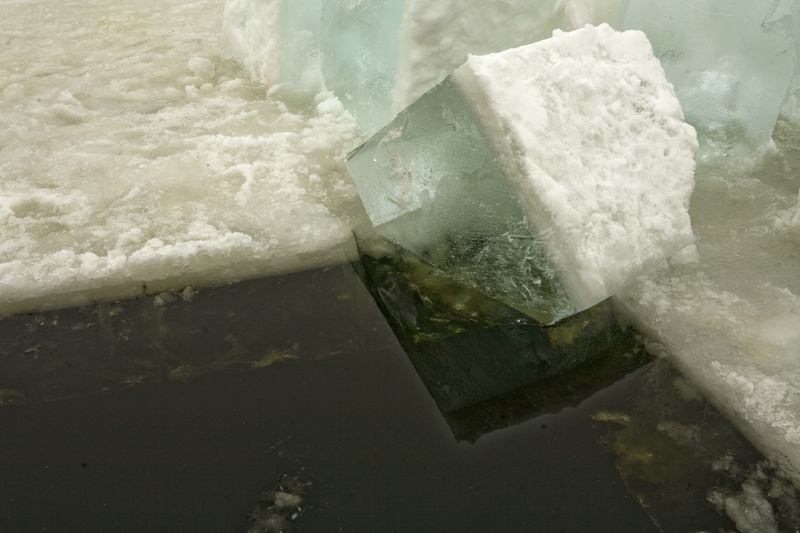 You can see the depth of the ice. I think one or two people may have gone in the water, perhaps to push the blocks up onto the ice, but I can’t be sure. Do any of the houses near you still have an Ice House? That’s what people used before fridges. You were probably taught all about their best alignment at architecture school. P.S. 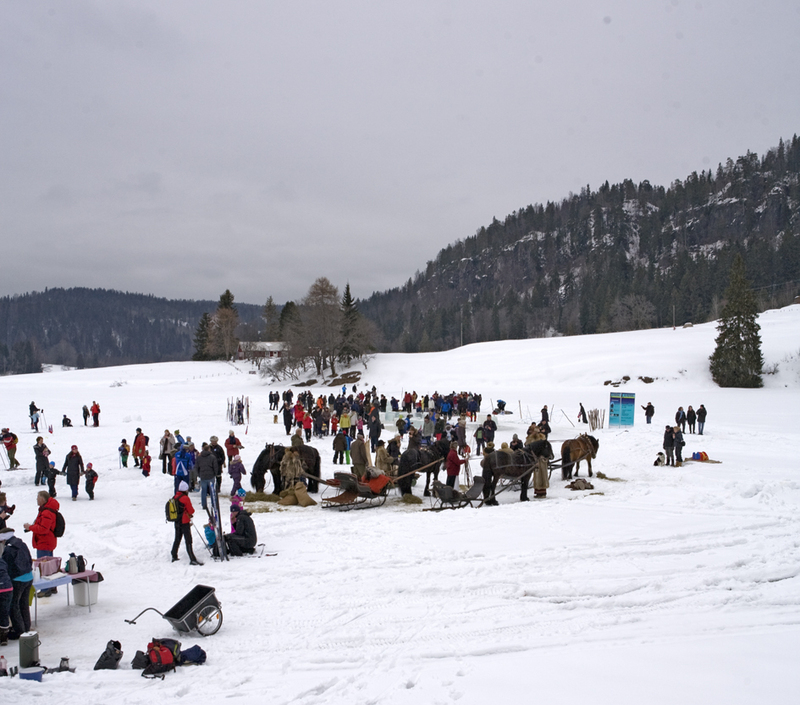 Ice Houses: unless they were Moghul Khans who used horsemen to rush snow from the mountains for their sherbets. P.P.S. Those large holes in the ice surely invite someone to invent a golf-on-ice type of game. Golf on ice is curling, isn’t it? Or maybe curling is horseshoes on ice. Somewhere I’ve got a picture of my great-uncle Jack’s ice house, on his farm in Canada, in the 1930s. I think refrigerators came quite late to Norway. There are some purpose-built ice houses around here, I think, but most people made do with a stabbur or larder outbuilding. A fantastic scene. In fact, even the colors are Brueghelian. 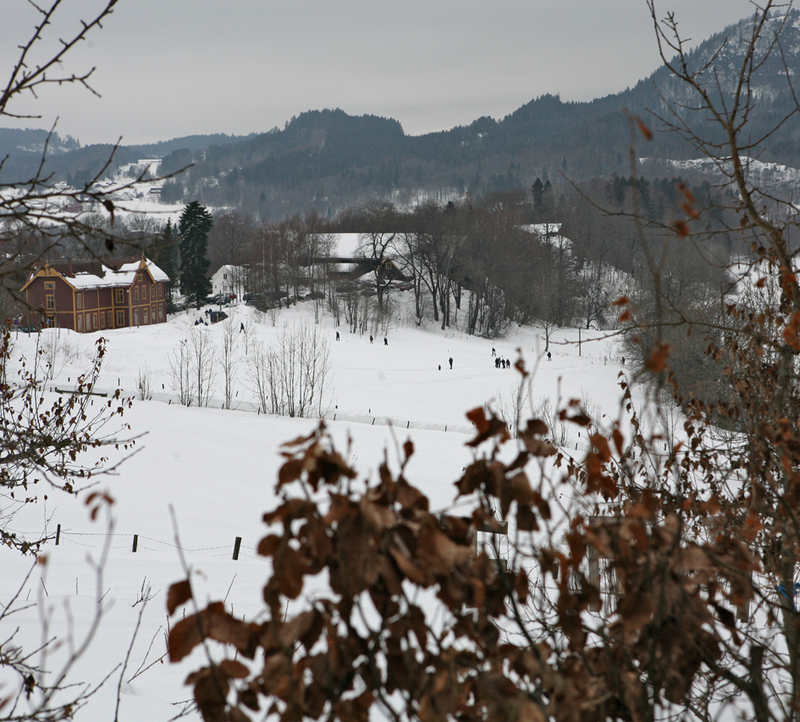 It is pleasant to know customs and views like this still exist over there. Curling is shuffleboard on ice. Beautiful scene. I love the gigantic ice-cubs. Have you seen how they saw these blocks and how they pull them out? I has to be a difficult job. Queen Victoria must have been a heavy woman. I don’t think there’s much help in having people pushing from below. You’d need something with more buoyance, like Queen Victoria or a horse. Or the horse and its buoy. But I’d rather cut one side of the hole slanted and let the horses pull out the blocks. May be fun swimming, though. No mention of the queen, but here is a piece about Norwegian ice in Victorian England. Thank you, empty, this piece answered my questions. I remember once seeing ice in long blocks being delivered to some sort of store, or perhaps a restaurant, most likely in order to be placed in ice compartments in a glacière, before the advent of refrigerators in Europe. That must have been shortly after the war. Thanks for that link, Ø. Very interesting, I ought to have found it myself. 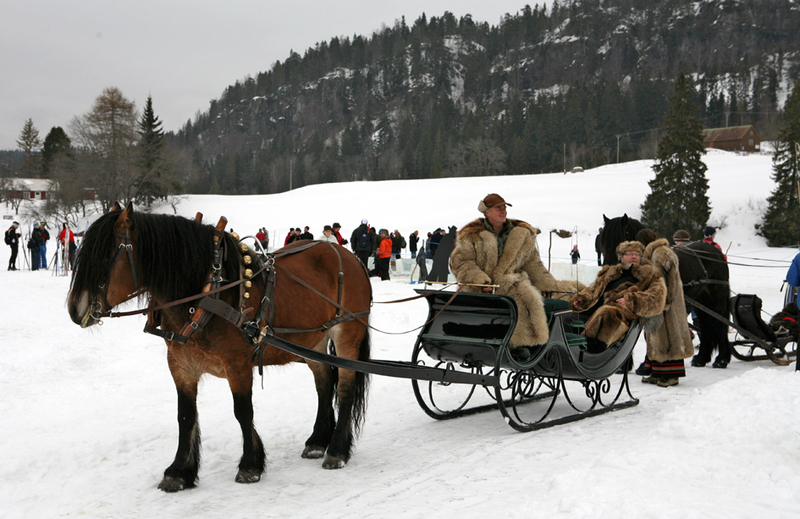 Trond, I think you’re right, they must have been using the horses to pull the ice out. If only I’d got there fifteen minutes earlier. I’ll try to be on time next year. Studiolum, I imagine that Hungary still has these traditional scenes occasionally too, doesn’t it? Where I grew up you didn’t need a fridge. You’d have a ventilated larder on the north side of your house and a meat safe high up on the outside north wall. I suppose it would also have been possible to use evaporative cooling, but I don’t remember anyone doing it. Hot summer days were hot enough to ensure that children would enjoy playing under a hose or swimming in the river (or the sea) but we never got the disagreeable hot, humid weather that we get here in East Angular every July. As a child I spent many holidays in Norfolk and it was always bloody cold and windy. I expect you’re experiencing global warming. Some people in Britain now have (shock, horror) swimming pools in their garden. I tell friends of mine that when they retire they should move near to an airport and put a swimming pool in their garden. That way they’ll see lots of their grandchildren. dearie, this is the best advise you can give them (if they want to see their grandchildren, of course). I know for a fact that this is absolutely true (most of the pictures I show here are at my parent’s swimming pool, which it isn’t a big thing, but it’s more than enough for us. My mother-in-law is now thinking on renting a summer house. Bruegel père or fils? Some people seem to get confused between the two. But tell me, Arthur, couldn’t you lend them your chainsaw, the one you were using at your campement the other day? That would have been nice of you instead of letting them use these enormous, old-fashioned and back-breaking hansars (handsaws). We got an e-mail from a Japanese friend today. She said that the aftershocks are so severe and frequent that she is dizzy. When they knocked down an old building at the local estate some fifteen years ago, they found an old ice cellar underneath. How did they know it was an ice cellar and not some other kind of cellar? What part of Japan is your friend in? Sig, funny you should mention my chainsaw. Today I could hear someone on the lake cutting the ice with one. I don’t know what they’re doing with all the blocks of ice they’re taking. I think I used that Breugel of yours somewhere. Unfortunately I can’t think how to retrieve it from the great pile of posts lying around in my computer. Julia, I didn’t realise that was your parents’ pool. Do their cats and dogs swim? Cats never swim if they can avoid it. And dogs… well this is top secret information, I’m sorry. Don’t these holes create a hazard for those who walk on the frozen lake? Have you noticed what appeared at the bottom of the post? Is this an advert? So far we hadn’t had any on WordPress. The ice block and saws, when viewed from a “non-narrative perspective”, are oddly wonderful… and, I was going to say, a bit frightening. Yes, you’re right. You don’t quite know what they are supposed to cut off. Sig, wordpress posts advertising, but you don’t see it on your own blog. Presumably they don’t want the blogger to dislike it and move somewhere else. Now I should do a post saying that I abhor Miso Soba Noodle Soup. On Sunday there were ropes around the holes in the ice, but today there are forty people down there making a film, and the ropes are gone. I never see any Miso Soba, etc or any other ads on this blog (or Siganus’s). Now I see Lazy Day Pot Roast. Would you like some italics with this? Why are we talking about soup? With those ice cubes we should be debating martinis or G&Ts. We’re talking about soup because some of us see some advertising at the end of the post. Have you too? Outstanding examples of italics and bold, Julia. I have taught you all I know. Is the advertising in synch with the blogs? If it were published by wordpress, would they advertise Lazy Day Pot Roast on Polyglot Vegetarian? Great, because that’s all I can learn (copy & paste, and maybe change a little thing). Did WordPress informed you of this novelty? I wonder why they’re linking you to Food Press considering yours is not a food blog. The same thought pop up into my mind when I read that recipe. It’s not terrible difficult, ok, but that’s not my idea of a lazy day. Perhaps they mean that you’ll need a lazy day after you’ve eaten their enormous pot roast. I haven’t seen the meerkats advertising things – what, binoculars? The goats have been outside for the first time recently. They may be appearing again here soon. Julia, I think I learnt my html skills from Language Hat. He knows a way to display the little symbols without them disappearing when you post the comment. He once told us, but I’ve forgotten. Car insurance: the proposition is that the company is called “Comparethe market.com” and that you should carefully distinguish it from “Comparethemeerkat.com”. This whimsy is then spun into yarns of rococco silliness involving, at their daftest, warfare between armies of meerkats and mongooses. Many of the meerkats are presented as members of the Tsarist aristocracy, so they speak in a suitable eccent. That meerkat looks a lot like Putin. He also looks like the weasels at Toad Hall, in the film of The Wind In The Willows. “”. After the word(s), type “”. If you forget the “/”, the italics will continue past the desired end. For Bold, do the same thing, substituting “b” for “i”. For Bold Italics, apply one of these “treatments” first, then apply the other one outside of the “treated” word(s). Never use “>” by itself or whatever you write after it will disappear. Let’s see if this works, since there is no preview function here. Well, my method didn’t quite work. It looks like using ” twice cancels what is in between the quote symbols (but not always, I don’t know why). So: for italics, uses left arrow, i, right arrow before the word or word sequence, and left arrow, slash, i, right arrow after the word or sequence. Same with b instead of i. I think the rest is OK.
m-l: I can only do it by copying the line ajp sent at fcbook, but yes, for bold just change the i for b.
m-l, from looking at your comment in “Edit Comment” I can see the html. To post a “>” you need to write & g t ; (only without spaces between them). I wonder if they’ve slotted your blog as foodie because the bot interprets ‘goat’ as an ingredient? Sorry goats. The horse drawn sleighs are delightful. I want to be a neurasthenic heiress who needs to be taken on regular sleigh rides to get the roses back in my cheeks. Sigh. When she was younger, my daughter tried to get the goats to pull a sleigh. What was in it for them? They didn’t see the point. I once appeared as a ferret in our local amateur production of “Toad of Toad Hall”. I’d rather be a non-neurasthenic heiress who can drive the sleigh herself. Julia, when you’re ready for the next step, maybe you’d like to learn to embed a link to a web page. It’s done with “a” instead of “i” (as for italics) or “b” (as for bold); but of course there’s a bit more to it. Here the Y is the text that will appear (highlighted or underlined or something), and the X is the web address that one of us will be transported to if we click on that text. I really recommend this for the feeling of mastery that it brings. If you want to be a non-neurasthenic heiress there’s a “next step” for you too, Ø.
I just looked at a Spanish ISO keyboard. I couldn’t see a “>”, maybe that’s why it’s easier for Julia to copy & paste the html symbols. Thank you very much, empty, you’re really nice. And I copy & paste it when I need it. There is “>” in my keyboard, I only have to use shift for it. Don’t try to find other excuses: just admit my dumbness. I agree, he is really nice. Of course, Julia, you have posted links before. This is just me trying too hard to be helpful. What would that next step be, do you think, Crown? Some kind of hormone injection? Maybe as a side-effect it would cure me of my condescending attitude toward women. hey, I never implied nor thought you were being condescending. Was my comment “you’re very nice” out of place or ridicule? It’s so difficult to use well a language you doesn’t master. Not at all! Helpful can be misconstrued as condescending, though I can’t imagine that happened here. Ø may have misunderstood what you meant by “just admit my dumbness”, perhaps he didn’t see that you had written the same thing elsewhere. I don’t really see “mistakes” exactly. You aren’t writing an academic dissertation, and what you write is very easy to understand, so it’s more like hearing an accent. – I hope that’s not condescending. I’m influenced by the Norwegians, who never correct my mistakes (they would think it rude; the big disadvantage is that my Norwegian doesn’t improve very much). Julia, I’m just in an odd mood. Maybe it’s my neurasthenia acting up. I never really thought that I had not offended you. Do you know how to do that one? No, empty, please tell me! AJP, yes I say that a lot. No mistakes? “you + doesn’t” can’t be right! But you’re very nice too. A way to pick up new tricks is to check the source code of the webpage and see how the trick is coded. I don’t know where you find it in Internet Explorer, but in Thunderbird I get a separate sourcecode window with Ctrl+U. It’s almost unreadable at first glance, but I use some text string to search out the paragraph I’m interested in. I saw that soup banner the other day, and that’s the only time I’ve noticed an ad here. I first thought it had something to do with the post — some elevated pun beyond my knowledge of Breugel — but when I got around to commenting I’d forgotten all about it. I don’t remember how I have embedded YouTube videos. The words “source code” fill me with a faint but real dread. I think it’s something that wordpress permit. Dearieme, I loved your Kapitsa story. Anglophones will guess the English. Oh what a delight to know that’s the same animal. My college roommate could make a noise like a guinea pig. I believe in loudly disliking whatever pops up in the ad. I have nothing against couscous or asparagus when they’re less intrusive. Sourcecode frightens me too, so I just go in there to hunt and gather. I didn’t even think about checking for an “insert” option at YouTube. When I was hitchhiking in Australia in extremely hot weather, I was allowed to sleep one night in an ice factory that worked overnight. Very refreshing it was. At home we had an “icebox”. It had a big compartment on top into which a standard ice block was placed, and the food compartment below got quite cold, enough to stop the milk and meat going off, anyway. The ice delivery man used a one-block-sized pair of scissors tongs like those shown by AJP. I’m surprised blocks of ice don’t melt too fast to use. These were large blocks, not ice cubes, and they fitted into compartments of the same shape, closed with doors, so there was little air around them. Think of the time it took to defrost freezer compartments before self-defrosting refrigerators were invented. True, but I was thinking of the ones empty linked to that went by sea all the way from Norway to London. Or the ones at my great uncle’s house in Saskatchewan that apparently lasted all through the summer. The blocks in ships, and in ice houses, were very well insulated – often with straw – and in confined spaces, generated a very cold atmosphere. In ships, by definition, they were being transported in winter as well. Ice houses were usually underground, too. Large quantities of ice blocks packed together would keep each other cold, and straw is an excellent insulator. Oh! I remember now. It was under the old dairy. And presumably something about the construction. Ok. I guess I have no choice but to accept it. Over here, we wanted to get a path made by the side of the road to the local school but we had to wait while they excavated the foundation of a small outbuilding belonging to the farm across the road. I don’t know why it was thought to be significant, but I can think of worse ways of spending my tax kroner.